Five hundred years ago next week, a Roman Catholic priest and theologian, Father Martin Luther, wrote to his bishop declaring his intention to enter into academic debate on some propositions that are known to history as the Ninety-Five Theses. This event is widely regarded as the starting gun to the Protestant Reformation, and its 500th anniversary is therefore being widely celebrated and commemorated, depending on one's perspective. 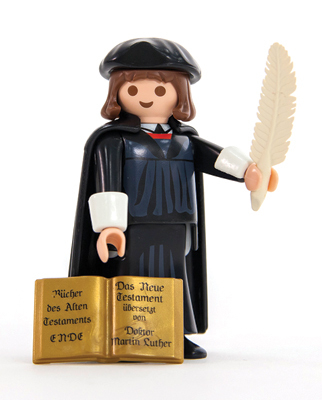 Playmobil has not missed out on the occasion, producing a commercially successful Martin Luther figurine. The anniversary has special significance for me, coming in a year when I changed from Protestant to Catholic, so I want to offer some brief thoughts on it, while admitting I am no expert on the sixteenth century. There is no doubt that Father Martin was, at first, a reformer, i.e. one who agitates for positive change from within a community or institution. If the Ninety-Five Theses are provocative, they are certainly not a negation of the Catholic Church or its doctrine. Even on the main topic discussed in the Theses, namely indulgences, Father Martin declares, "If, therefore, indulgences were preached according to the spirit and intention of the pope, all these doubts would be readily resolved" (Thesis 91). Luther's initial complaints contained many valid concerns. Had they been been given a proper hearing rather than met with hostility by the Catholic establishment, and had Luther been more willing to conciliate, things might have played out differently. As Bishop Robert Barron points out in the video below, we might today have in the Catholic Church a Lutheran Order just as we have a Dominican Order, a Franciscan Order and a Jesuit Order. The great tragedy of the sixteenth century is that this did not happen; instead the Body of Christ was torn asunder by the greatest schism since, well, the Great Schism. Luther was excommunicated and parted company with the Catholic Church and with some of her historic doctrines. Yet, at the very Council of Trent that anathematized Protestant doctrinal errors, the Catholic Church also enacted sweeping disciplinary and administrative reforms. One might therefore argue that Father Martin indirectly left a positive legacy in the Catholic Church: his Ninety-Five Theses were seminal in bringing about the "Tridentine Reformation." This was the true and legitimate reformation of the Church that took place in the sixteenth century. By contrast, the Protestant Reformation, as it became known, was not genuinely reformative: it did not seek merely to reform the Church from within but to reinvent it from without. The Protestants fundamentally redefined both what the Church is and the epistemology of Christian doctrine. If one thinks of the Church as a house, a reformative movement could be likened to a thorough housecleaning, or even to renovation and refurbishment. These actions maintain the integrity of the pre-existing structure. What the Protestants did was more like moving out of the house and building another, albeit using the plans for the original house and thus replicating its architecture in important ways. Of course, the Protestant movement did not finally result in just one other house but in many other houses, as Protestants disagreed among themselves about how to build the ideal house. Five hundred years after the Ninety-Five Theses, Western Christianity resembles a strange, sprawling suburb with houses of various size, age and design. The original house still stands, however. And there is more good news. The Catholic Church has been influenced for the better by some Protestant-driven developments, e.g. in biblical scholarship. Even more importantly, the last fifty years have seen more ecumenical progress than the previous 450 combined. It is unlikely that many of the inhabitants of the various houses in the strange suburb are going to move back into the original house, but at least the suburb has begun to look more like a neighbourhood, a community.